He is the most interesting blogger in the world. How effectively can I transfer a thought from my head to yours? In all of the books and blogs I’ve read and presentations I’ve watched, there are many strategies and tactics for effective communication. In my opinion, there is one that stands out as much more important than any of the others; the inverted pyramid. It’s a common strategy in journalism and was even the subject of a recent Hubspot blog post that questioned its applicability to blogging. But my pyramid is a little different from theirs. I’ve taked two different strategies and combined them into a single, simple concept that I used for writing blog posts, creating presentations and designing web pages. I use it because it’s based on science and also because I actually find it a little aggravating when consuming content that doesn’t conform to this model. If you want to learn this simple approach to creating better content, read on to find out how it works and what specific steps you can take to use them yourself. When dealing with anything related to the mind, I think we have a tendency to forget that the brain is an organ. This means that the better we understand the biological workings of the brain, the better we’ll understand how to communicate and persuade. In order to explain how the brain makes decisions, I’ll turn things over to Simon Sinek and his TED presentation, How Great Leaders Inspire Action. The first 8 minutes of his presentation cover the essence but in case you don’t have the time or ability to watch the video right now, here’s the TL;DR (too long; didn’t read) cheat cheat: Our typical mode of communication is to tell people WHAT we do and then sometimes explain HOW we do it. Great leaders don’t do that. They begin with WHY they do what they do, then they explain HOW and finally end with the WHAT. It’s completely reversed and based on brain biology. All decisions are emotional. All of them. As supposedly rational human beings, we have a hard time accepting this. We want to think that we make rational, informed decisions and it is true that they are influenced by our neocortex but it’s the limbic brain that always pulls the trigger. This has been demonstrated by people with limbic brain injuries who are rendered incapable of making the simplest decisions, like what to have for breakfast. If you want to persuade people, the approach is very simple; start with why. I’ve taken Sinek’s Golden Circle and changed it into an inverted pyramid. There are a few reasons for this. First, it lays nicely on top of the more traditional inverted pyramid of journalism (more on that in a minute). Second, it make more visual sense (to me, anyway) when conceptualizing communication. By making use of this approach and adapting it to your own blog (or sales pitch or LinkedIn profile or pitch deck or business presentation), you will become a much more effective content marketer. We want people to see our headlines and click through to the blog. We want the visitor to read the post in its entirety. We want the reader to take some action. The inverted pyramid is the best way to make this happen. Get someone emotionally hooked with “why” they should care (#1). Explain “how” the product, service, technique, etc. will improve their life (#2). Deliver “what” they need to know in order to justify the decision they already want to make (#3). What Are My Inverted Pyramid Tactics? My inverted pyramid approach is based on a combination of Sinek’s Golden Circle and the traditional approach in journalism. What exactly is it? It’s a metaphor for a style of writing most frequently used by newspaper reporters. The idea is to prioritize the presentation of a set of facts by placing the most important ones first. The term “most important” is obviously subjective but should convey that concept deemed most important by the writer. The opposite approach – presenting the least important facts first – is called “burying the lead” because you can’t arrive at the article’s point until reading through to the end. A comprehensive take on the inverted pyramid in journalism; courtesy of Wikimedia commons. In the Hubspot blog post I mentioned in the opening, the author, Ginny Soskey, makes the case that the inverted pyramid doesn’t work for business blogs. Her reasoning is that business blogs should “When reading business blog posts, people need to be hungry for more content after reading the introduction, not satiated with the information from a few sentences.” This is absolutely true and she argues that multiple studies have concluded that online readers a) scan instead of read and also b) read significantly more text than broadsheet (i.e. newspaper) readers. This is where my inverted pyramid differs from the traditional. What Ginny didn’t really mention is that the mission of a journalist is much different than a marketer. A journalist’s job is to relate facts and tell a story without any persuasion whatsoever. That’s why they want to provide the most important information first. But as we’ve from Sinek’s presentation, the secret to influencing and persuading is not to start with facts in the first place. But we also know we’re battling with information overload and so simply reversing the journalist’s pyramid won’t work either. Here’s a second look at my inverted pyramid. For the purposes of business blogging, we need to strike a balance between fact-based journalism and marketing persuasiveness. We need to figure out how to apply the important principles of Sinek’s Golden Circle with the goals and requirements of the modern business blogger. It depicts the balance between the importance of each step versus the window of opportunity we have to accomplish it. As you can see, the biggest challenge is the “why.” It’s the single most important step with the smallest window of opportunity. People need to read your headline and feel an emotional reason to click through. Upon arriving, your opening needs to immediately offer a preview of coming attractions – or put another way, you need to explain “how” the reader’s life will be better after reading your entire post. Finally, the rest of the post has to tell the reader “what” your overall point is. 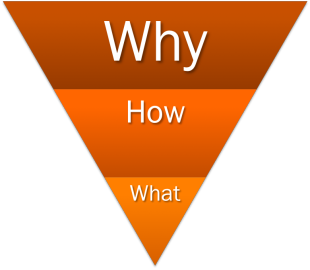 Here’s the thing; most bloggers spend 90% of their time on the “what” and very little on the “how” or “why.” This is why headlines are so critical to business blogging; they comprise the majority of the top of the pyramid. The lead (opening one or two paragraphs) is almost as critical and will go a long way towards determining whether or not the visitor sticks around to read what you’re writing. If you’re still reading, then obviously it did. Now take a look back at the structure of this post and see how I applied the inverted pyramid. Why: The headline begins with this very word! I tried to invoke a sense of curiosity and play on the emotional triggers of mystique and power. How: My opening mentions a system I’ve developed and specifies how learning it will make your business blogging better. This is amplified by the inclusion of Sinek’s video, which further explains how the concept works. 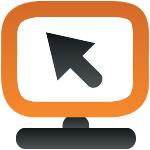 What: The bulk of the post provides the details to explain exactly what the approach entails. If the “why” and “how” have done their job, then the balance of the post is really an exercise in not screwing it up! As I alluded to earlier, this has wider application than just business blogging. It’s absolutely critical to any sales pitch you might be developing or presentation you’re authoring. And I also rely on this very heavily when creating web pages. Whenever you find yourself trying to persuade someone, remember to start with the why.